1. Jobs report: The U.S. economy lost 33,000 jobs in September as the country took a hit from Hurricanes Harvey and Irma. Economists had expected employers to add 90,000 jobs -- already well below the monthly average of 175,000 so far this year. The storms were mostly to blame for the lackluster numbers: Harvey shut down activity in Houston for days, and while Irma and Maria hit businesses in Florida. The jobless rate dropped to 4.2%, the lowest since 2001. 2. Pound under pressure: The British pound has had a very rough week, shedding 2.5% against the dollar since Sunday. The currency has declined 13% since the Brexit vote. Prime Minister Theresa May turned in a lackluster performance at an annual meeting of her Conservative Party earlier this week, raising questions about her leadership. The pressure on May increased another notch on Friday when a political rebellion aimed at removing her from power burst into the open. May has pledged not to step down, but her position seem less stable by the day. 3. Week of records: The S&P 500 added 0.6% on Thursday to close at its sixth consecutive record. It's the index's longest streak of records since 1997. The Dow Jones industrial average gained 0.5%, while the Nasdaq increased 0.8%. 4. 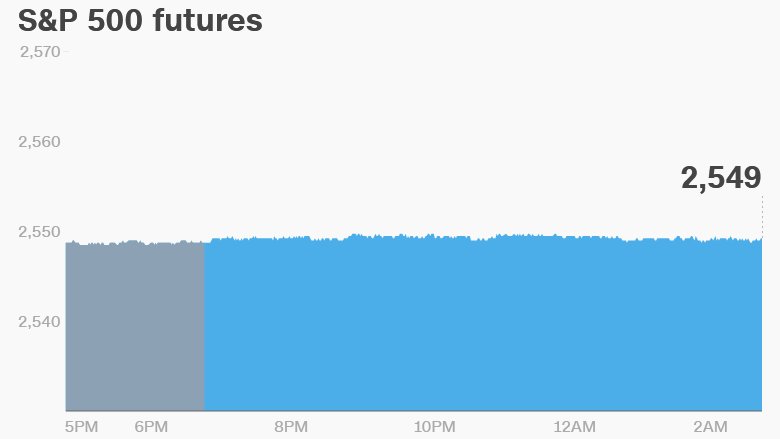 Global market overview: U.S. stock futures were lower on Friday. European markets were mixed in early trading, with British and German indexes in positive territory. Worries over a potential declaration of independence in Catalonia weighed on Spanish stocks. Asian markets ended the session higher. 5. Stock market movers -- Costco, Netflix: Costco (COST) share were down 3% in extended trading after its earnings report missed estimates on Thursday. Netflix (NFLX) was 1% higher in extended trading after it hiked prices on its standard and premium streaming subscription services.